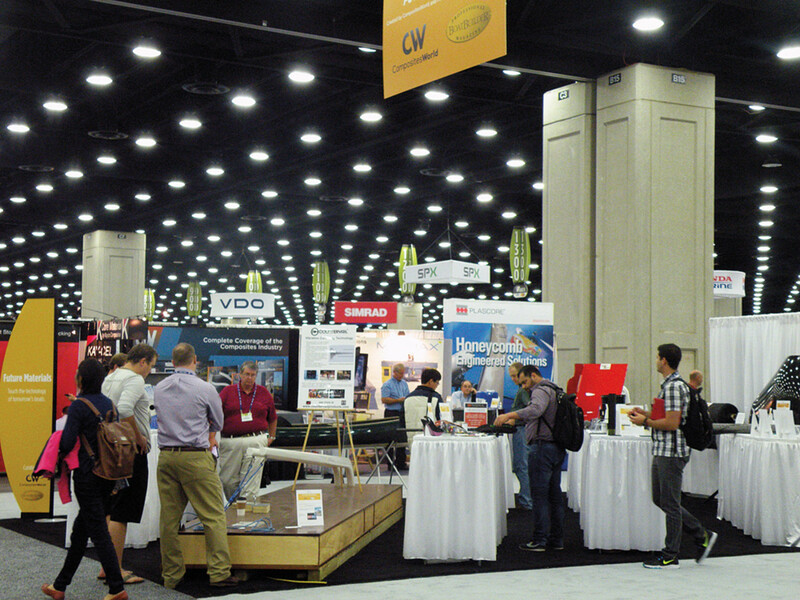 The Future Materials hands-on exhibit at the center of the Composites Pavilion should draw big crowds at this year’s International BoatBuilders’ Exhibition & Conference. Check out the display from Hypetex, which is bringing color to carbon fiber for the first time. The Future Materials hands-on exhibit at the center of the Composites Pavilion should draw big crowds at this year’s International BoatBuilders’ Exhibition & Conference, bringing together innovations from the marine, aerospace and automotive industries and some applied academic research. The pavilion will consist of more than 75 companies in more than 12,600 square feet of exhibit space. The third floor of IBEX will feature the Composites Pavilion, which will include the Future Materials showcase and Composites Tech Talks, sponsored by Composites One and Magnum Venus Products on Tuesday, Oct. 4, from 5-6 pm. The editors from Professional BoatBuilder and CompositesWorld magazines are curators of the collection. At last year’s Future Materials display, boatbuilders, designers, technicians and others “got to know [new] materials and processes firsthand in a casual environment where they could hold new unprocessed laminates, touch and visually inspect samples of finished composites and experience live demonstrations of more subtle qualities, like vibration dampening,” says Professional BoatBuilder magazine editor Aaron Porter. Ginger Gardiner is senior editor of CompositesWorld magazine. I recently had a chance to pick her brain about key areas of development under the umbrella of innovation and new materials, and she pointed out products and technologies that the exhibition will showcase. Q: Why should the marine industry be interested in the Future Materials display in the Composites Pavilion? A: Because material and process developments in the composites industry are happening very quickly. Some technologies — like N12 Technologies’ NanoStitch® products and Connora Technologies’ Recyclamine® hardener for epoxy resins — are commercially available now and may be able to provide that solution that a yard or shop needs to make a project successful. Other developments, like recycled carbon fiber prepreg molding compounds and Hypetex colored carbon fiber, are providing new aesthetic options that can differentiate a manufacturer’s products and help them take advantage of high-growth global trends. Look at the interiors for the Lamborghini Huracan and the David Yurman Forged Carbon Moto by Walt Siegl Motorcycles, as well as Aston Martin’s custom-colored interiors and trim. Q: What are some of the current future materials, processes and technology trends? A: When it comes to materials for building and manufacturing, improving strength and capacity without adding weight (using lighter materials) is the overriding goal. Those materials and methods are certainly within reach of more companies these days, but the recycling of materials is also a growing area. For instance, resins can be turned into thermoplastics, serve their life and then be recycled in environmentally friendlier ways (no burning of fiberglass). This recycling can be done, for example, by soaking a material in warm vinegar so that both resin and continuous carbon fibers are available for reuse. Some companies that are avidly recycling include Trek bikes and Niche snowboards. BMW is using recycled carbon fiber (RCF) in sheet molding compound (SMC) parts on the new 7 Series, and Airbus also is looking at using hybrid SMC with RCF for interiors and has other reuse/recycling projects underway. Q: Can you name an exhibitor or product at this year’s IBEX that serves as a good example of recycling being put to use? A: Of course. At IBEX, Connora Technologies will show fiber-reinforced composites made using its Recyclamine® hardener, which turns epoxy into a thermoplastic that can be fully recycled. Connora has recently publicized the world’s first recyclable surfboards and also a program with Burton Snowboards to transform what was previously unusable thermoset laminate scrap from the deck into thermoplastic molding material for making snowboard bindings. The goal is “zero landfill manufacturing.” Think about all of the scrap in marine manufacturing today and how much of that could be converted into molding compounds for pressing hatch covers or even sold to companies making SUP paddles, for example. What if your waste could now add to your bottom line? This is definitely futuristic technology, but there are already manufacturers of marine parts today that are using relatively low-cost and even used compression molding presses to make really attractive, complex-shaped composite parts. Q: Can you name some other ways technology is being used to improve products? A: Yes, in the area of aesthetics. The use of colored carbon fiber allows companies to separate themselves from the pack, bringing more value to their brand. 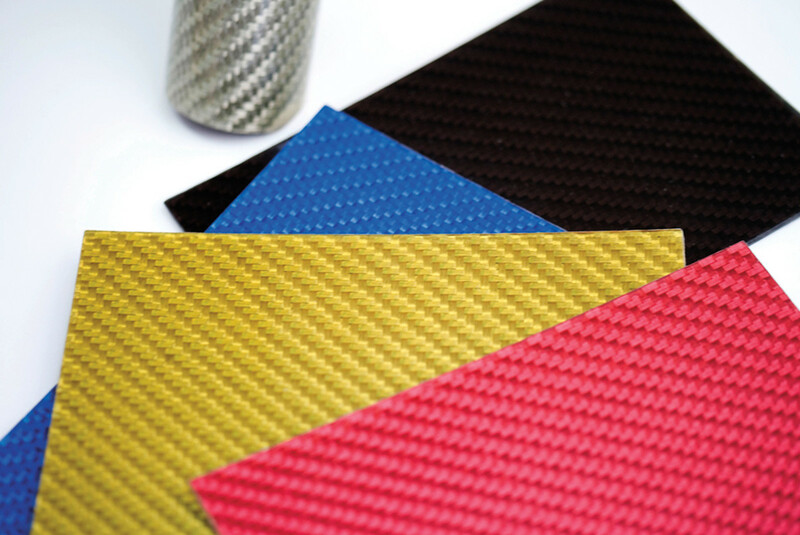 Products made with Hypetex® colored carbon fiber will be on display. Q: Multifunctionality has become a major focal point for boatbuilders. They’re making sure boats can be used for fishing, diving, water sports and dining. You’re saying that multifunctionality is a big part of the direction of new materials? A: The idea is to add functionality to one product, component or part. Materials Sciences Corp.’s proprietary Countervail vibration-canceling material is a good example. The material reduces noise and vibration in the overall composite laminate and also maintains properties to strengthen and stiffen the overall part. Q: What about trends in processes? A: What we are seeing is better productivity and quality control through automation and hybridizing. For example, robotic equipment can now carry out the job of applying chopped strand mat in a boat layup for a more efficient, accurate distribution. We are also seeing the use of chopped carbon fibers to add stiffness and light weight, but at a lower cost premium than aerospace-grade continuous fiber. There is also wet compression molding, where textiles are wet out with liquid resin and then molded in a press. Q: Recreational boatbuilding has sometimes been criticized for being behind in the use of technology. Is the industry getting better or catching up? A: I am seeing more instances of technology being adopted. It may be hard to see innovation when you walk a boat show, but companies are trying to become more advanced and use more environmentally friendly materials and methods. Case in point: Scout Boats now builds its new 42-foot center console using epoxy resin and the resin infusion molding process. For a production builder like Scout to commit to epoxy resin, which is more expensive than your typical polyester, and resin infusion, which definitely requires a good understanding of the process, is really a big deal. Viking Yachts’ 92-footer is also built entirely with resin infusion. Q: How do you convince marine companies that the investment in new technology is worth it? A: I think suppliers have to keep working with manufacturers to trial new materials and processes and develop the data needed, such as cost, weight, cycle time, waste reduction, etc. I would never advise adopting new technology without stepping through development and doing testing, even if it’s just inexpensive shop-floor testing. Plenty of the suppliers involved in the Future Materials display work with customers to develop the business case data — for example, Vectorply. However, manufacturers need to be willing to look at change and take advantage of opportunities to innovate. Today’s consumers are well educated and are always looking for new features, better performance and more value. And millennials, especially, are rewarding companies that invest in products and manufacturing practices that help protect our planet instead of destroy it. Even if a company could make one small step each year or each model — a bio-based material here, a recycled/recyclable material there, a less energy-intensive process on this part, or extension of composites in that part to save even more weight and improve fuel efficiency — each of those helps to create a total picture of innovation and progress, vs. just standing still. Each one of those can be used to improve performance, differentiate the product and increase its value. For me, that’s what Future Materials is about, helping marine manufacturers find new ways to innovate and succeed. This article originally appeared in the September 2016 issue.